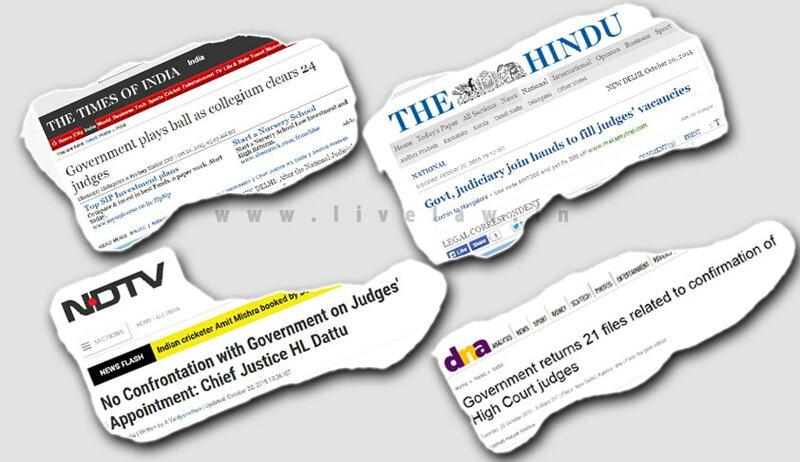 Eager to comment and analyze the effects of the National Judicial Appointments Commission being declared unconstitutional, news agencies are flooded with conflicting reports of the Government response to the recommendations of the SC collegium. TOI reported that the Centre has sent for President’s assent, the names of 24 Additional Judges, in six High Courts of the country. It reported that Union Law Minister V. Sadananda Gowda promised the CJI that the Government would send the files to the President for his signature. The CJI was quoted as saying, “It was my moral duty to see that these 24 additional judges did not suffer uncertainty because the Supreme Court is on Dussehra break.” Some of these Additional Judges were to face an expiration of term this week and hence, the situation demanded an urgent response from the CJI as well as the Government. While all was amiable according to the TOI report, DNA has reported that the Government has returned 21 files sent by the SC collegium for confirmation of High Court Judges. The Government only cleared the appointment of one Bombay High Court Additional Judge for another two years. These files, it said, were among more than 100 recommendations made by the SC collegium, before the NJAC was notified in April this year. The conflicting reports intensify the debate regarding the proposed effects of the NJAC being declared unconstitutional. Immediately after the verdict, CJI Dattu had put the collegium machinery into motion, in view of the expiring terms of several Additional Judges in various High Courts of the country. With the vacancies in the High Courts of the country reaching 39%, clarity on the issue of appointments is paramount. We can merely hope for a more prudent attitude from the Government’s end in view of the dismal straits of the High Courts of the country.